I don’t usually begin an article by admitting that I don’t have the exact connections between my wife Susan’s families and the subject being written about. Many have written on Michael Beeghly’s story and some have admitted the same thing while others have actually published the fascinating account and their genealogical ties. Perhaps the most compelling support that Susan is related to Michael is the number of same-family surnames who once called the small Amish community of Brothersvalley, Somerset County, home: Bowman, Forney, Horner, Musser, and Livengood, for example. We’ll investigate all of these and more, but first, let’s hear the sad yet griping tale of our cousin, Michael Beeghley. According to more than one Beeghly biographer, his family had descended from German nobility. Just as he eventually took on the calling for the ministry, I’m reminded of another prince, this one named Gallitzin, of Russian parentage who gave up wealth and earthly power to serve God on the American frontier in Cambria County, PA. Both men were born in the same era, but Beeghly was an Anabaptist, an Amish-Mennonite, and Gallitzin was a Roman Catholic. Today, Gallitzin has a state park named for him and an historical marker. He was the inspiration for two Catholic colleges, one at which I taught for 21 years. 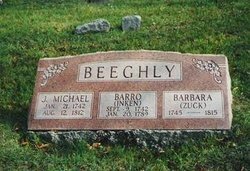 Aside from mentions in several history books, all Beeghley has is a simple grave marker erected by his descendants (see photo below).There are other similarities, coincidental and otherwise, and also great differences, as we shall see. First, the Beeghly name has several spellings: “Buechley” in newer German, “Beeghly” on Michael’s American tombstone, which we’ll use here, and “Buchele” (mit umlaut) on German church records. Later, some of his descendants legally changed the spelling, and pronunciation, to “Beachley” or “Beechley.” No doubt there are yet other spellings. No wonder many descendants doubt that they’re related. Many non-English speaking immigrants spoke their names to officials in port and those in turn recorded what the name sounded like. Another often confusing practice was how German Christian household began their names with a Bible moniker, in this case “Johann,” “John,” or even “Joshua” in English, but sometimes nicknamed “Hans” or lengthened to “Johannes.” See the article “German Naming Customs” for more details. Thus, the family patriarch is listed as grandfather Johann Michael Buchele, born in 1680 at Eutingen, German Province of Baden. Tradition claims that a member of the family had been knighted a century earlier. In 1711, in the same parish, this Michael married Agnes Herman and they produced nine children. The fifth was our Michael Beeghly’s father, Johann Adam Buchele (b.1718), who married Catrina Hirtzler (b.1722). The story goes that the marriage was “morganatic,” sometimes called a “left-handed marriage,” that is of lower social status thus requiring the husband to give her up, and any children born of the marriage, if he wishes to inherit the wealth, power, and privilege of his family. She may have been Amish-Mennonite or German Brethren, but church records say, whether true or not, that Adam’s two children were conceived by “whoring” and “cohabitation before wedlock,” in other words illegitimate. The truth is that the Church would not have conducted nor recognized such a marriage between such parties of differing statuses anyway. Often, the practice went so far as to encourage sending the lower party as far away from the Church-State as possible, and in the case of father Adam, when he was about to inherit his castle, he sent his wife Cathrina Hirtzler and son, pre-teen Johann Michael (1742-1812), to live in America, probably with her people. One emigrant list records their arrival on the ship St. Andrew in 1751. Another record says 1750 on the ship Brotherhood. Perhaps she came with her husband, who then returned, or with her parents, with whom she stayed. But after landing in Philadelphia and settling just north in Germantown, Cathrina received word that she too was about to inherit a large fortune. Her father had been a judge in Baden. German law, however, required that she and any children return to the Old World to personally claim the fortune. The lore says that, whether because of her Anabaptist values or the hardship it would take to sail back across the sea, she took several years to decide. About 1753, Cathrina and the children began their journey back to Europe. 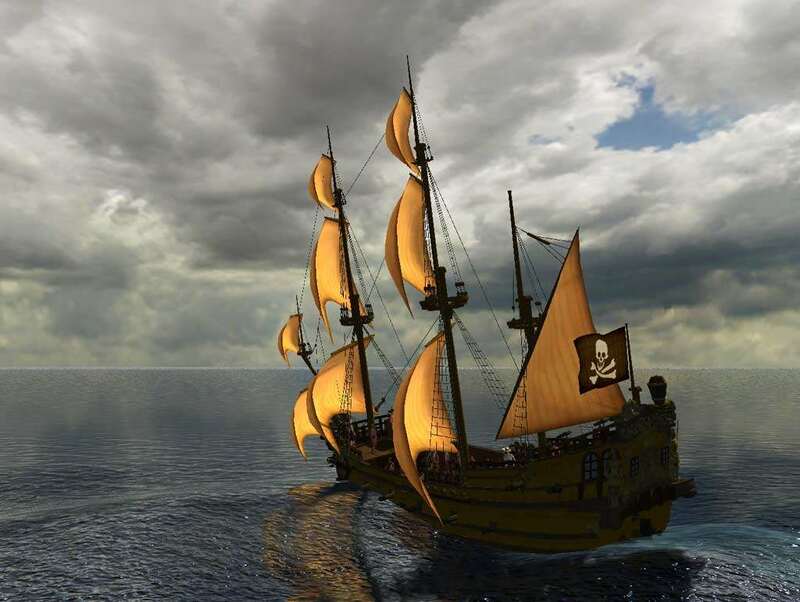 Sometime during the voyage their ship was overtaken by sea-pirates. Tragically, Cathrina was either killed outright by the outlaws or simply died of fright and young Michael was taken prisoner. History doesn’t record what happened to Michael’s younger sister. For two years he lived at sea under the rule of the pirates until one day the ship moored in the port of Philadelphia. Somehow Michael managed to escape. He apparently swam to shore and eventually made his way back up to Germantown, where a German family took him in and raised him. As for Cathrina’s inheritance, one researcher supports the idea that it was never claimed and that taxes eventually consumed it anyway. Less than ten years later, 1762, Michael married a young woman of supposed Indian descent by the name of Barro Inken. We assume that she was a Native American, but spellings of her name vary. After giving birth to several of Michael’s children, Barro died (1789) and he married again, this time to Barbara Zook, or Zuck or Zug. Altogether, between his two wives, Michael sired 13 children. In the days before the outbreak of the American Revolution, all colonists had to decide which side to take. It’s believed that the transplants were split three ways: on the side of the British, on the side of the colonies, and no real opinion. The Amish-Mennonites in “Penn’s Woods” were in a difficult position. On the one hand, their faith forbid them from fighting, but on the other, they had taken loyalty to the English King George just to be able to sail to the new land. Now some of the Anabaptists actually paid their taxes as citizens and were more or less left alone, although they took scorn from both the loyalists and the patriots. 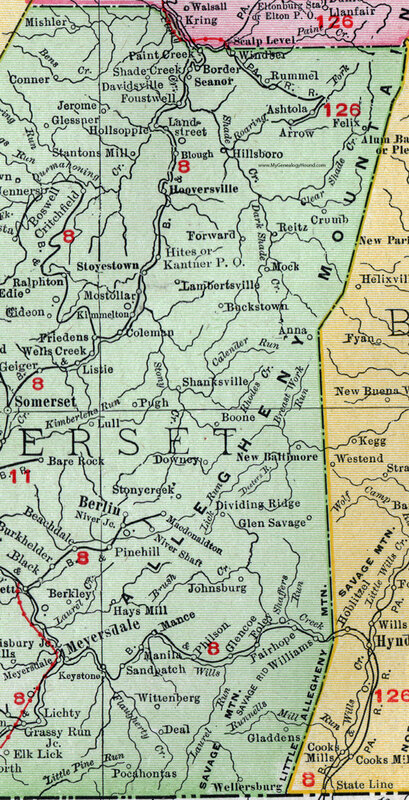 Most of the Amish-Mennonites made their decision with their feet and headed for the newly expanded Pennsylvania frontier in the Northern Appalachian mountains of Bedford County, later split into what was called Somerset. Michael and his family loaded their worldly possessions onto a Conestoga wagon in 1773 and headed west along the old Forbes Road, now U.S. Rt. 30 and 31. When they got to the top of the Allegheny Mountain at the Bruders Thal, or today Brothers Valley Township, where many other Amish-Mennonites had already settled, they unloaded their wagon and horses and began to make a home. Many writers and historians refer to this rich farmland as “The Glades,” because of its abundant water supply and rich pastures. From this late 18th century paradise, my wife Susan’s Amish-Mennonite ancestors spread to all corners of the county and some west to both sides of the Mississippi River. 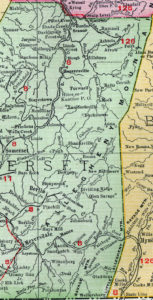 At times in history, the lines among the various Anabaptist congregations are blurred, particularly in Somerset County. In Germany and Switzerland, what were simply called “Brethren,” split to what became the Amish in Alsace, France; Mennonites in Holland; and perhaps a dozen other congregations in America. 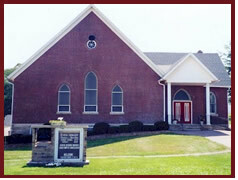 Michael took fellowship with the German Baptist Brethren in Somerset County. They are sometimes called “Dunkers” or Dunkards” for their “Anabaptist” beliefs, or practice of being rebaptized as adults. Today, the most populous sect of this movement are called Church of the Brethren or Grace Brethren, although at least a half dozen other, more conservative congregations exist. As for their rich history, genealogists Beeghley and Forney put it this way, perhaps tongue in cheek: “In this aggregation of persons holding widely differing views on almost all Christian duties, except those of devotion and piety, it was found difficult to collect a sufficient number who were of one mind, to establish a congregation.” Seems that applies to the history of all Christian denominations. 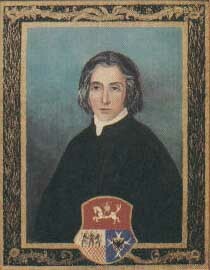 Michael Beeghly was elected to the ministry in 1784. The elders of the church, after 1st century Christian tradition, simply cast lots, believing that God would choose the best candidate. In Somerset County today, the Amish maintain such a practice. Four years later, Michael was honored with the next step, ordination as a preaching elder, or Bishop. Michael was a generous and free-hearted boy. The family with which he made his home [in Germantown] had gone away and left Michael at home. In the meantime, there came a class of “Ziegeiners” [gypsies] begging for something to eat. Michael cut some bread and gave it to them. The family did not approve of this free-handed generosity, so when they went away again and left Michael as housekeeper, they hid the knives. Again came this band, begging, “Scheiner, viser sweine muter, geb mire win bissel spech, den gehe icy foudir evech. [“Pretty white swine mother, give me a little fat meat and I shall go away from here.”] Having no knife with which to cut bread, Michael gave them the whole loaf. What must his adoptive parents have thought when they got home? His generosity was also evident at the end of his life too. After accumulating hundreds of acres of farmland, according to early Somerset County tax assessment lists, he built barns and buildings and even what is said to have been one of the county’s first tub mills. Have a look at how Bishop Beeghley dispersed his earthly wealth via his Last Will and Testament among his wife and children. You’ll enjoy attention to detail, but most of all, his innocent misspellings, writing the way words sounded in his first language, German. If Michael was born in the conflict of kingdoms, was raised in the conflict of Old World versus New, left Eastern Pennsylvania for Brothersvalley because of the impending American Revolution, he died in 1812, the year of the second war between the United States and Great Britain. He lies at rest on what was once his family farm, today the Elias Cober Cemetery, in Somerset County, PA. The farm and graves are located in the village of Pine Hill, five miles southwest of the Borough of Berlin. Michael rests with his two beloved wives in the mountains where he found peace and purpose. Several descendants, wishing to respectfully keep their memories alive, replaced the old field stone markers, chiseled simply “M.B. 1812” for Michael and “B.B. 1815” for Barbara, with a beautiful memorial. Our research continues to find our possible or probable connection in both directions from Michael Beeghly’s amazing life: who were his ancestors and how do we fit into the tree of his descendants? Check back from time to time to see what progress we’ve made. Scripture says that we are refined in the fires of adversity, and this could not be more true in the life of Michael Beeghly. The majority of what we hear and read about him is surely true, and the rest just adds to his mystique and powerful personhood. We began with a brief comparison to Prince Gallitzin, Michael’s Catholic neighbor to the north who is today a candidate for sainthood. Both men ministered, married, baptized, and buried literally thousands of believers on the Pennsylvania frontier, yet our Catholic friends seem to have venerated their great brother to higher esteem. Of course piety and humility was the basis of both their callings. I’m reminded that, as reformed Christians, most of the readers of this essay espouse the doctrine of Luther, “The priesthood of all believers.” We believe that all of the elect are saints, so surely we have faith that someday we’ll sit at the common table of both these great men, Gallitzin and Beeghly. W.G. Beeghley. Descendants of Michael Beeghley and Barro Inken.